Joan Walsh is known for her contribution to the development of Numerical Analysis and Scientific Computing at the University of Manchester and in the UK more generally. She also had a major impact on undergraduate teaching at the University of Manchester. After her studies at Oxford and Cambridge, Joan was appointed to a Lectureship in the Department of Mathematics at the University of Manchester in 1963. She progressed through the positions of Senior Lecturer and Reader before being appointed as Professor of Numerical Analysis in 1974. 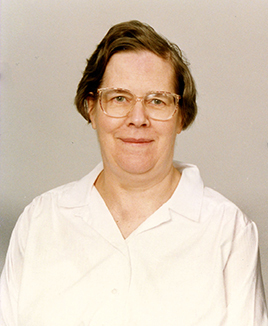 Joan led the Numerical Analysis group at the University of Manchester until 1985 and helped establish the Manchester group as one of the leading Numerical Analysis research centres in the UK. Her research interests focused on the numerical solution of ordinary differential equation boundary value problems and the numerical solution of partial differential equations. Joan was Head of the Department of Mathematics between 1986 and 1989, and subsequently became Pro-Vice Chancellor of the University of Manchester in 1990 Joan’s tenure as Pro-Vice Chancellor coincided with substantial, and sometimes controversial, changes in undergraduate teaching - for example, the introduction of semesterisation and of credit-based degree programmes. Among her external leadership roles, Joan was Founding Chairman of the Numerical Algorithms Group (NAG) Ltd and a Vice President of the Institute of Mathematics and its Applications.